PSX Wild Arms (USA) in 1:07:32.68 by lapogne36. Wild Arms is a Western-themed role-playing video game developed by Japanese company Media.Vision. Originally released in Japan in 1996 for the PlayStation, it was later translated and released in North America in 1997 and Europe in 1998 by Sony Computer Entertainment. It is noteworthy for being one of the first role-playing video games on the PlayStation, as well as one of the few to feature a Western American setting and motif. 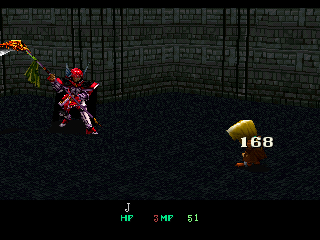 The game features 2D computer graphics for normal gameplay, while battle sequences are rendered in 3D. Taking place in the fantasy world of Filgaia, Wild Arms follows the adventures of a band of miscreants and adventurers called Dream Chasers who scour the world in search of excitement and fortune. The player assumes control of a young boy named Rudy who has the ability to operate powerful weapons called Ancient Relic Machines (ARMs), forbidden remnants of a lost age that resemble firearms. Along with his companions Jack and Cecilia, the group must use their respective skills to navigate through the vast wastelands and dungeons of Filgaia and prevent an otherworldly threat from reviving their lost leader and destroying the world. While this movie played by lapogne36 features a lot of heavy glitches, it still avoids the arbitrary code execution techniques that could have made the movie way shorter, but probably less entertaining as a whole.